Thanksgiving day in Canada is on October 10, 2016. Thanksgiving Day in Canada has been a holiday on the second Monday of October since 1957. It is a chance for people to give thanks for a good harvest and other fortunes in the past year. Many people have a day off work on the second Monday of October. They often use the three-day Thanksgiving weekend to visit family or friends who live far away, or to receive them in their own homes. Many people also prepare a special meal to eat at some point during the long weekend. Traditionally, this included roast turkey and seasonal produce, such as pumpkin, corn ears and pecan nuts. Now, the meal may consist of other foods, particularly if the family is of non-European descent. 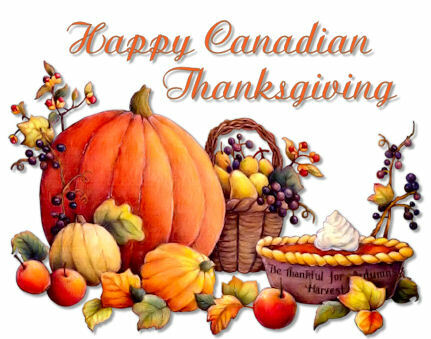 Thanksgiving Day in Canada is linked to the European tradition of harvest festivals. A common image seen at this time of year is a cornucopia, or horn, filled with seasonal fruit and vegetables. The cornucopia, which means “Horn of Plenty” in Latin, was a symbol of bounty and plenty in ancient Greece. Turkeys, pumpkins, ears of corn and large displays of food are also used to symbolize Thanksgiving Day. Other popular activities include outdoor breaks to admire the spectacular colors of the Canadian autumn, hiking, and fishing. St. Paul’s United Church (25 Gore St. West, Perth) is hosting QUILTS IN THE CHURCH on Saturday, May 7th, 2016, from 10:00am to 4pm. Admission is $5.00, $6 lunch takes place from 11am to 1pm. The facility is wheelchair accessible. 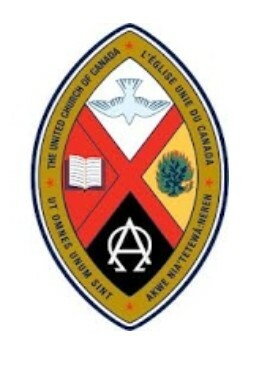 For further information please contact Marilyn at 613-267-2688 or visit the website at www.stpauls-uc-perth.org. 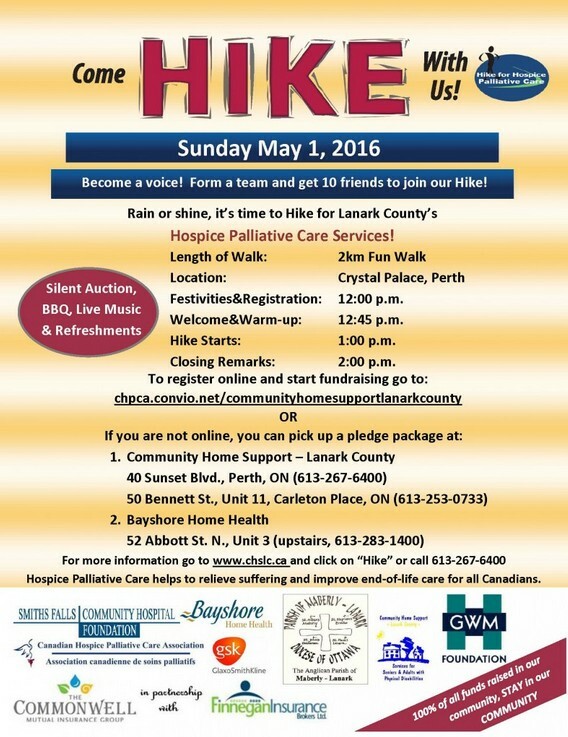 The annual Lanark County Hike for Hospice palliative care services will take place rain or shine, from noon to 2:00 PM, Sunday, May 1st, 2016 at the Perth Crystal Palace. Come out and join your friends and neighbours for a short walk around town to support this important fundraiser. All monies raised go to the palliative care programs provided by Community Home Support Lanark County and the Perth and Smiths Falls District Hospital. These programs provide essential help to people and their families across Lanark County who are dealing with life-limiting and end-of-life challenges. There will be a BBQ, music and a silent auction. Why not form or join a team now to raise funds for these important programs. You can register now online by following the hike link at www.chslc.ca or at the event. To register, please go to: chpa.convio.net/communityhomesupportlanarkcounty. Please call Community Home Support at 613-267-6400 for more information. Hervana is going acoustic to play the beloved Unplugged in New York album in full. This album holds a special place in many people’s hearts – ours included – and we’re excited to sing these songs with you. Hervana is a Toronto-based Nirvana cover band featuring Skirt Cobain (Carly Beath), Miss Novoselic (Erin Cousins), Dave Grrrl (Adrian Pasen) and Pap Smear (Michelle Turingan). The band features two Ottawa Valley ex-pats: Carly (Smiths Falls) and Erin(Almonte). In the two years since its creation, the band has played across Ontario and Quebec and at events such as World Pride, Lupercalia Winter Multi-Arts Festival and Wavelength. One of the most anticipated camp events of the whole year! At Santa’s Workshop kids get to make special gifts for their families under the guidance of MKDC staff. The projects are different every year but always awesome! We also wrap our gifts, make cards, and round out the day by making a yummy festive snack and playing some holiday games. Our staff look forward to this day just as much as the kids! 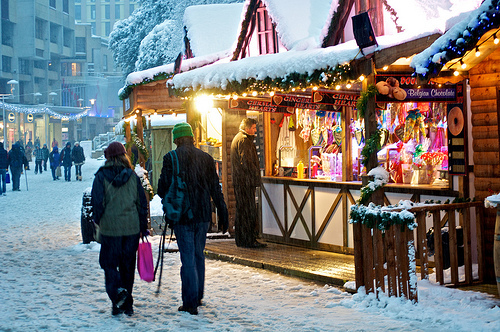 Psst… Parents… do you realize you’ll have the day free to do your Christmas shopping? In PEACE? We thought you’d like that. 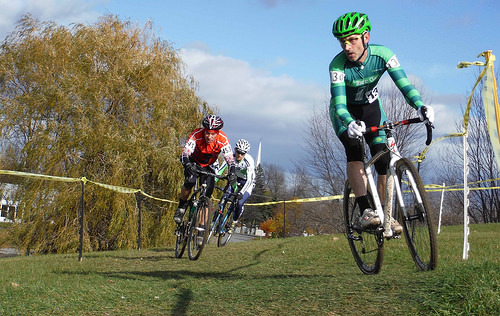 On Sunday, November 15th, the OTTAWA BICYCLE CLUB hosts their annual CYCLOCROSS RACE at Conlon Farm in Perth, 7am to 12 noon. Conlon Drive and Smith Drive will be partially closed to accommodate this annual race. For more information about the race please contact the Ottawa Bicycle Club. Thanksgiving Day in Canada is on 12th October 2015. The Thanksgiving weekend is also a popular time to take a short autumn vacation. This may be the last chance in a while for some people to use cottages or holiday homes before winter sets in. Other popular activities include: outdoor breaks to admire the spectacular colors of the Canadian autumn; hiking; and fishing. Fans of the teams in the Canadian Football League may spend part of the weekend watching the Thanksgiving Day Classic matches. Thanksgiving Day in Canada is linked to the European tradition of harvest festivals. A common image seen at this time of year is a cornucopia, or horn, filled with seasonal fruit and vegetables. The cornucopia, which means “Horn of Plenty” in Latin, was a symbol of bounty and plenty in ancient Greece. Turkeys, pumpkins, ears of corn and large displays of food are also used to symbolize Thanksgiving Day. It is a day to mark the single night in the year when, according to old Celtic beliefs, spirits and the dead can cross over into the world of the living. Some people hold parties and children may trick-or-treat in their neighborhood. Some people put a lot of effort into decorating their homes, yards and drives. They may even construct life-size replica graveyards or dungeons and invite people from the neighborhood to view their creations or hold a themed party. 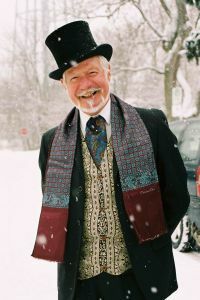 Other people may organize fancy dress parties for adults or children. Popular activities at parties include watching horror films and trying to make fellow guests jump in fright. Many children go out to play trick-or-treat. They dress up as ghosts, witches, skeletons or other characters and visit homes in their neighborhood. They ring doorbells and, when someone answers, they call out “trick-or-treat”. This means that they hope to receive a gift of candy or other snacks and that they are threatening to play a trick if they do not get anything. Usually, they receive a treat and tricks are rarely carried out. There are special types of food associated with Halloween. These include candies in packets decorated with symbols of Halloween, toffee apples made by coating real apples with a boiled sugar solution, roasted corn, popcorn and pumpkin pie or bread. Halloween beer, which is made by adding pumpkin and spices to the mash before fermenting it, is also available in specialist stores. Children also take part in a long-standing Canadian tradition of “Trick-or-Treat for Unicef”. 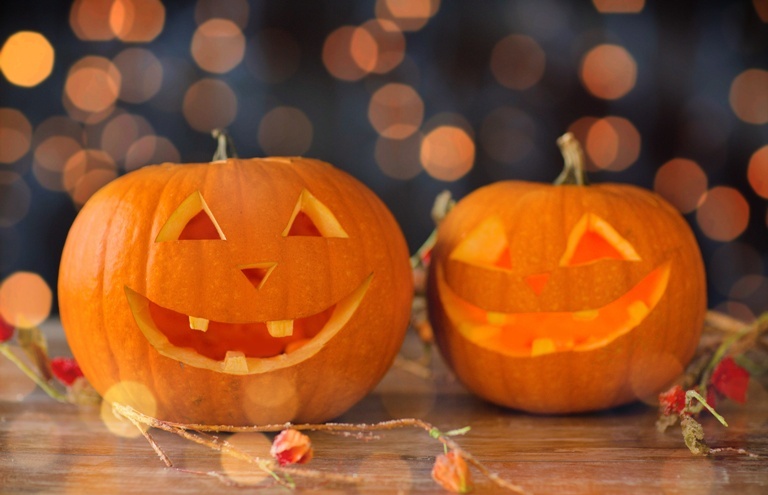 Pumpkin-carving contests, pumpkin art tours, a reading marathon, and symbolic Walks for Water are just a few examples of the educational and fundraising activities schools and children develop to help provide thousands of children developing countries with basic quality education. October 31 is not a public holiday. Schools, organizations, businesses, stores and post offices are open as usual. Some organizations may arrange Halloween parties, but these do not usually disrupt normal affairs. Public transport services run on their regular timetables. If people are driving around the neighborhood in the late afternoon or evening, it is important to be particularly aware of children, especially those wearing dark costumes, who may be unfamiliar with traffic conditions. Halloween has Celtic origins. In pre-Christian times, many people believed that spirits from the underworld and ghosts of dead people could visit the world of the living on the night of October 31. These spirits could harm the living or take them back to the underworld. To avoid this, people started dressing up as ghosts and spirits if they left their homes on October 31. They hoped that this would confuse the ghosts and spirits.